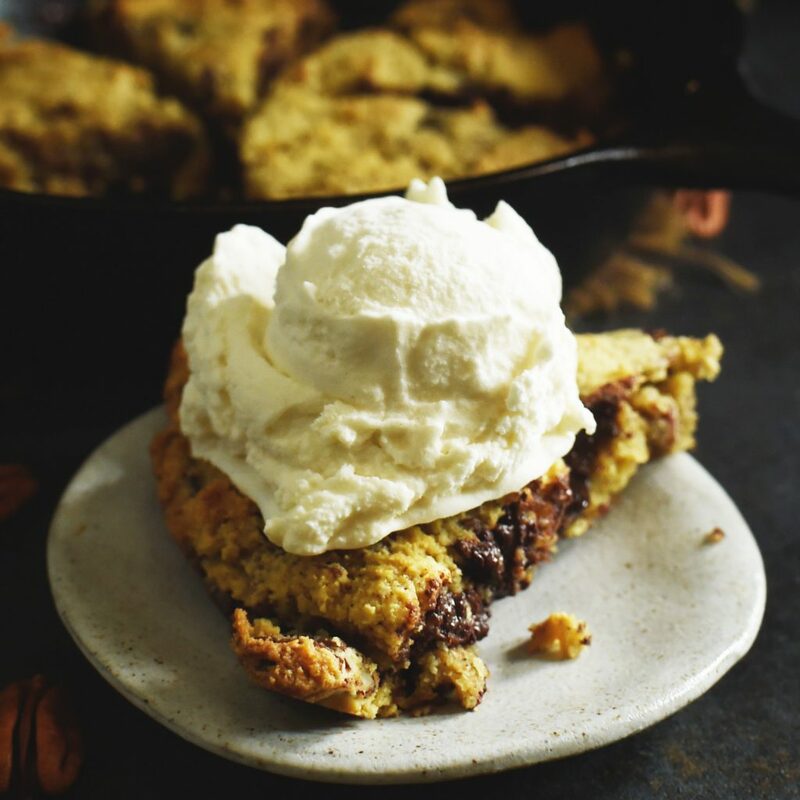 This Low-Carb Skillet Chocolate Chip Cookie Recipe makes a cookie that surpasses the flavor of it’s sugar-laden cousins. This cookie combines gooey melted chocolate with nutty pecan goodness. Yet, it can be part of a low-carb, keto, lc/hf, Atkins, gluten-free, grain-free, diabetic, or Banting diet. 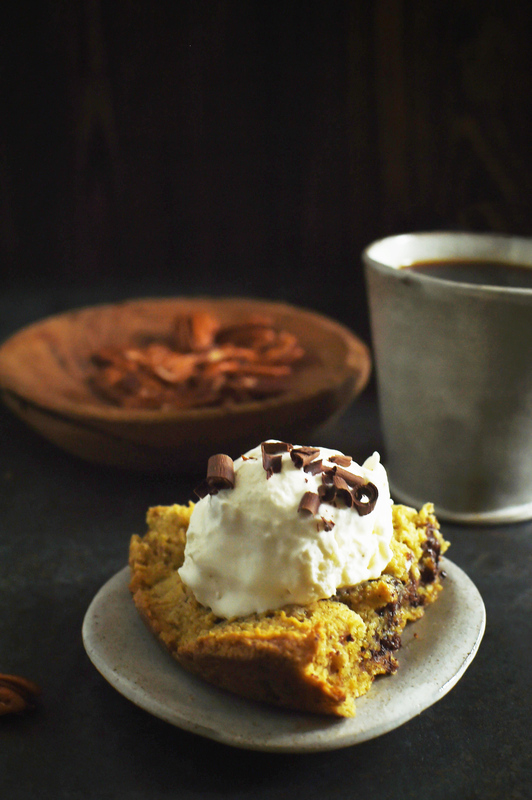 Sometimes a chocolate chip cookie craving just hits. This time, for me, it was a complicated craving. Not only was my soul screaming for a chocolate chip cookie, it wanted ice cream as well. I seriously contemplated making chocolate chip cookie ice cream sandwiches, but I didn’t want anything difficult. Besides, I feel like the best thing about chocolate chip cookies is the molten chocolate when they are fresh from the oven. It’s the contrast of hot chocolate chip cookie and creamy cold ice-cream that I was really looking for. I was looking for a truly, unfussy recipe–One I could whip up in a flash and pop it in the oven. I was not in the mood to futz with scooping out cookie dough and putting it on a baking sheet. No way. I wanted dough I could make with the press of a button of the food processor, spread in a pan, and pop in the oven. A few years back, I saw a whole article on using cast iron pans for baking. They used them for cornbread, brownies, and chocolate chip cookies. Yes. This is what I needed to do. Spread the cookie dough in a cast iron pan and bake the whole thing as one giant cookie. To create this recipe, I started with my recipe for Low-Carb Pumpkin Whoopie Pies and altered the life out of it. Then I resuscitated it into something that resembled chocolate chip cookies but weren’t yet the addictive chewy cookie cocaine I was looking for, so I altered it again. My next version hit pay dirt. The result was a chewy deep dish cookie that takes me back to childhood. The maple flavoring in this recipe really makes this cookie sing. You won’t even miss the brown sugar. 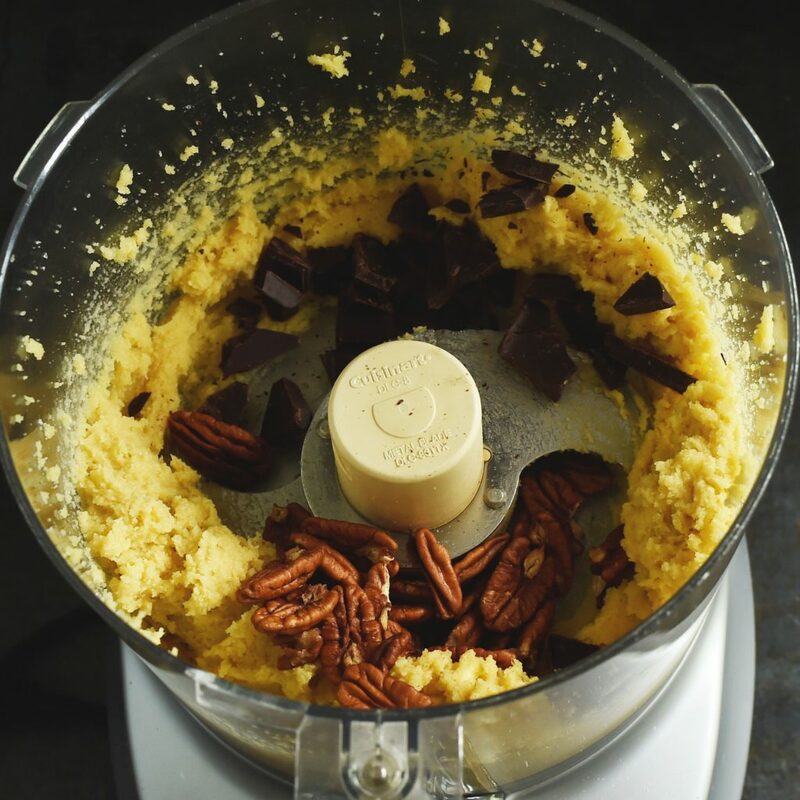 The pecans add another warming element that combines with the maple flavoring to create that old-fashioned cookie flavor. Consider yourselves warned. These cookies are a favorite of cookie thieves everywhere–Even cookie thieves who don’t eat low-carb present a problem. If you plan on saving some for later, hide them well! Cookie thieves have a knack for sniffing them out and confiscating entire platefuls! I had put three away for safekeeping, but when I went back for them, there was only one left. 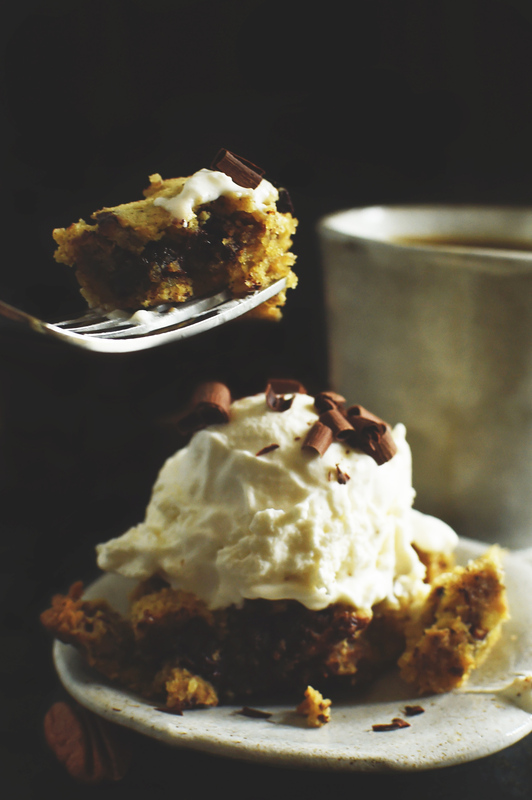 This Low-Carb Skillet Chocolate Chip Cookie Recipe makes a great snack or dessert. 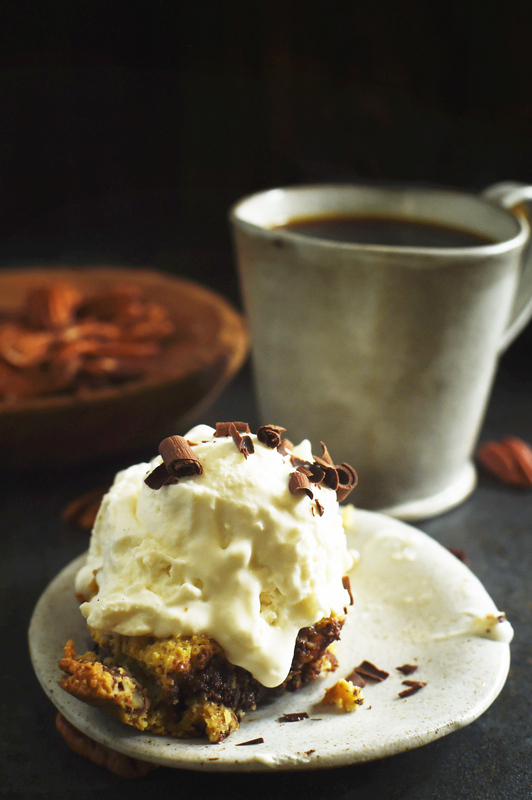 I like it best served with our Sugar-Free Vanilla Ice Cream. They can be served warm or cold. However, if you wait until later, be sure to guard them from the cookie thieves. Enjoy! 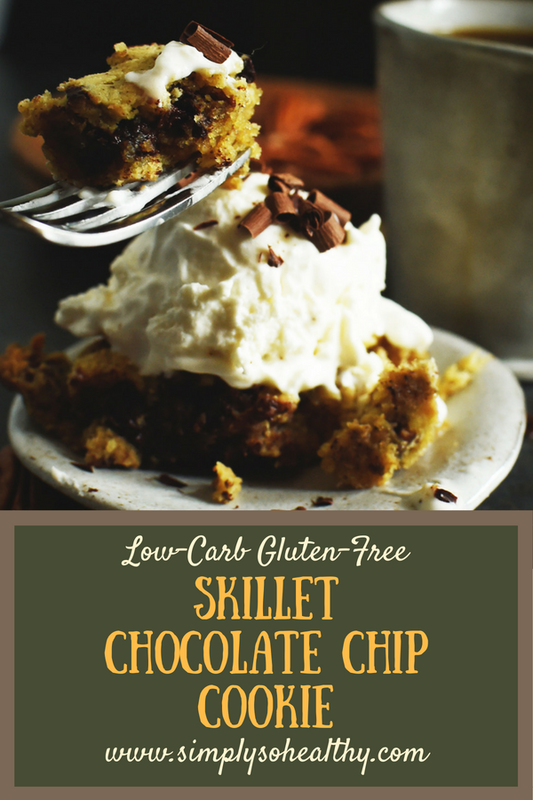 This Low-Carb Skillet Chocolate Chip Cookie Recipe makes a cookie that surpasses the flavor of it's sugar laden cousins. 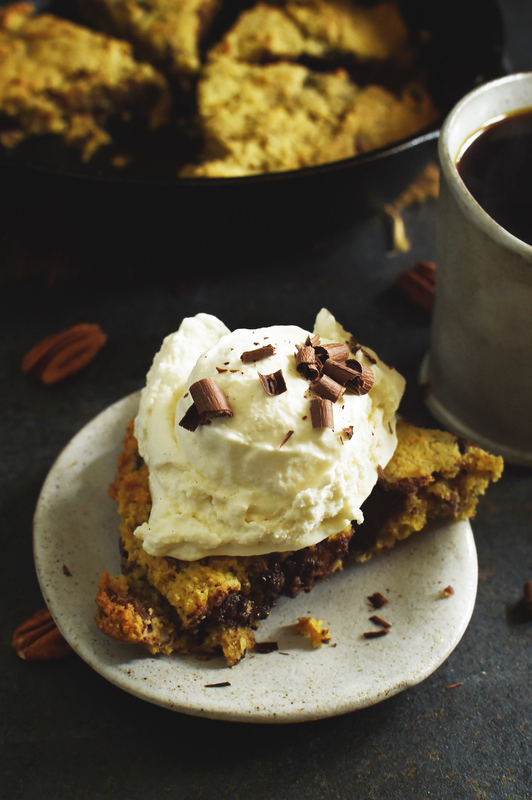 This cookie combines gooey melted chocolate with nutty pecan goodness. Yet, it can be part of a low-carb, keto, lc/hf, Atkins, gluten-free, grain-free, diabetic, or Banting diet. Preheat oven to 350º Fahrenheit. Butter or spray an 8" round cast iron pan with cooking spray. In a food processor pulse together the almond flour, granulated stevia/erythritol blend, baking soda, and sea salt until blended. 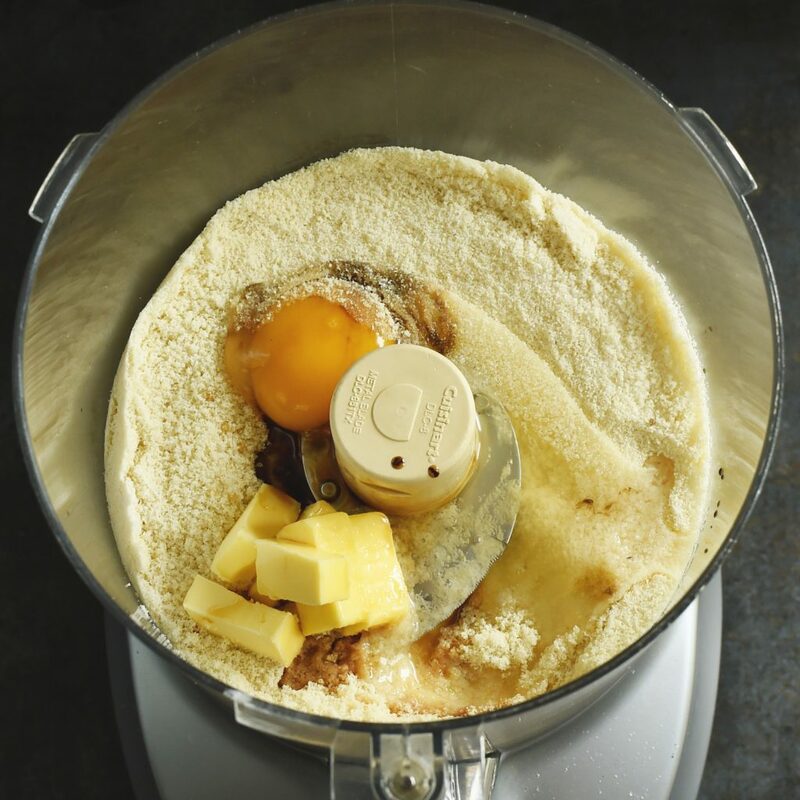 Add the egg, butter, and extracts. Pulse a few times until the mixture turns into a dough. 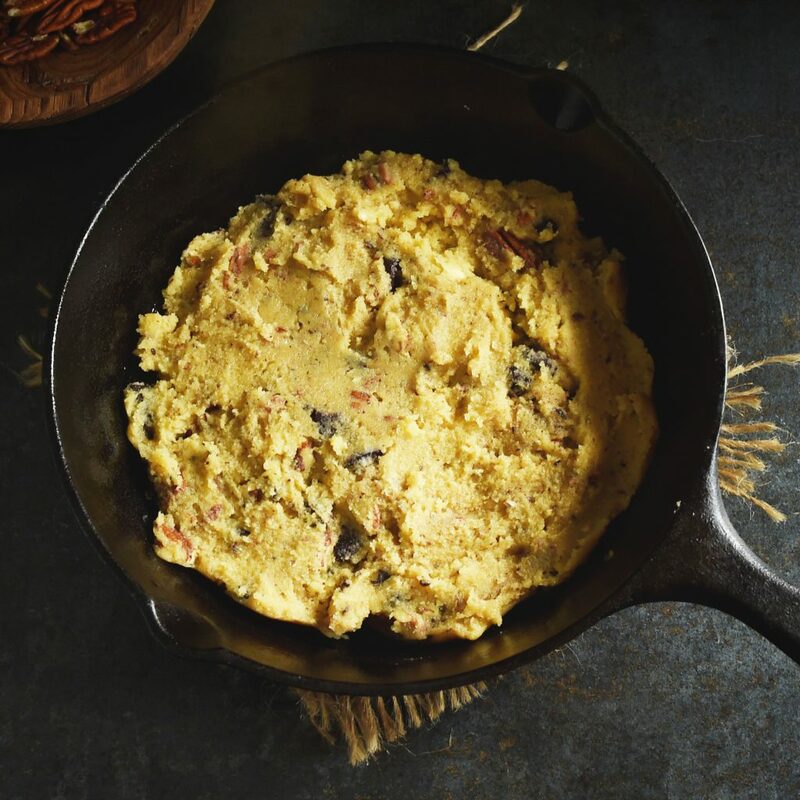 Spread the batter into the prepared cast iron skillet. Bake in the preheated oven about 18-22 minutes or until the top is lightly browned and the top springs back when lightly touched. Allow to cool slightly before cutting into six pieces. I made this over the weekend and when I tell you this is my most favorite keto dessert next to cheese cake, I mean it! I was skeptical about the baking soda, thinking you meant baking powder. I followed the recipe with the baking soda and it was wonderful. Thanks this will be my go dessert! You’re welcome! I often use baking soda because it doesn’t contain any added starch or grain. I’m glad you enjoyed it! Chocolate chunks are better, but would chocolate chips work if I stir them in? I have Lilly’s chocolate chips. Thanks. Chocolate chips would work perfectly fine. Just stir them in before you spread the batter in the pan. Enjoy! Can this be made without a food processor? You should be able to use a hand mixer or a strong arm and a spoon to mix the ingredients together. Just be sure to chop the nuts and chocolate before adding. Can granulated monk fruit be substituted? If so what is the substituted amount? Will this change the carb total? Are you talking about the Lakanto monk fruit erythritol blend? If so, I believe that is half as sweet as Pyure so you will need to increase the amount. Some almond flour brands are ground more finely than others. 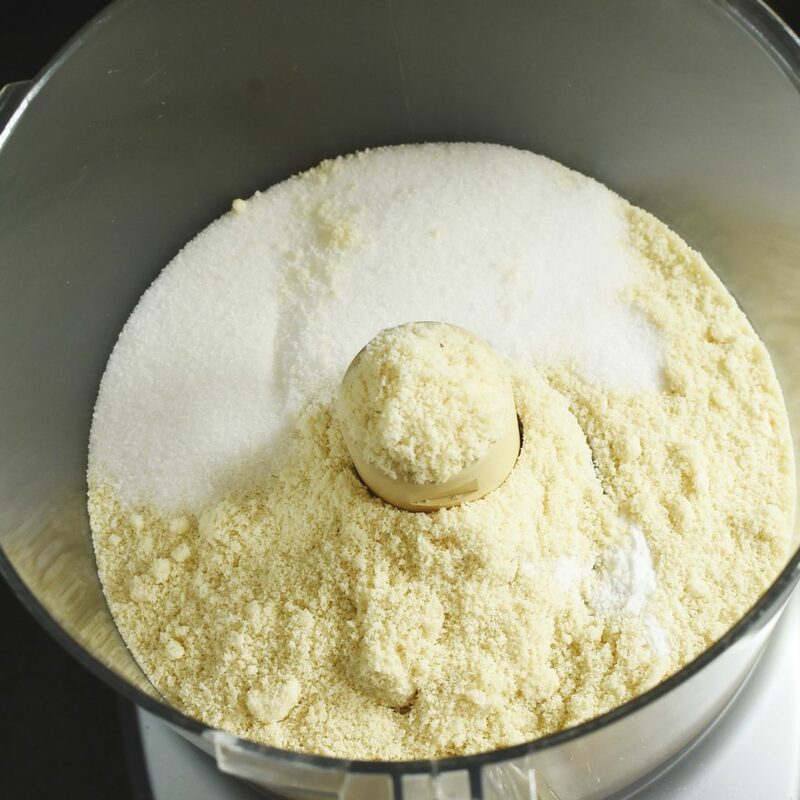 If your almond flour is ground to a powder, you can use it as is. Otherwise, processing it a bit will probably work fine. Would a pie dish work? I don’t have a cast iron pan. A pie pan might be a bit big. If I recall the pan I used was about 8″. You could probably use a small baking dish and get away with it. Just watch it carefully as the baking time could be different if it isn’t the same size and a different material may heat differently.